1. Stamp tag with Calais flourish stamp (Antique Linen or Vintage Photo). Ink edges with Vintage Photo. Set aside. 2. Cut 3 1/4 x 5" pieces of both black Bazzill cardstock and chipboard. You will also need template #2 if you have a kit or instructional CD (cut inside the black lines). If not, then you can create an oval in a Word document. First open a blank document. From the tool bar pick auto shapes, then basic shapes, then oval. The oval we are using is approximately 2 3/4 x 3 3/4". Really, it just needs to fit nicely on the piece of black paper. Set the chipboard and template to the side while you work on the black card. 3. You will need to emboss the black cardstock. Most of us old stamper's have been using this technique for many years (too many to count in my case). But, I thought I would spell it out just in case you haven't tried it. You need 5 things; your cardstock piece, a stamp (it really can be any size), embossing pad, and some embossing powder. I am using black embossing powder but you can use clear since our cardstock is black, it won't make a difference. Oh, and the last thing is a heat gun. 4. Ink the entire stamp. If you are using a smaller stamp to emboss the card, just re-ink in between stamping. You can see in the second picture that my card is still a bit longer than stamp. That really doesn't bother me, in fact I like the way the finished card looks so I chose not to trim that part off. The stamp is a favorite of mine from All Night Media found at Michael"s.
5. The stamp will leave a print even though it might look to you like it is too light, don't worry it's there. 6. 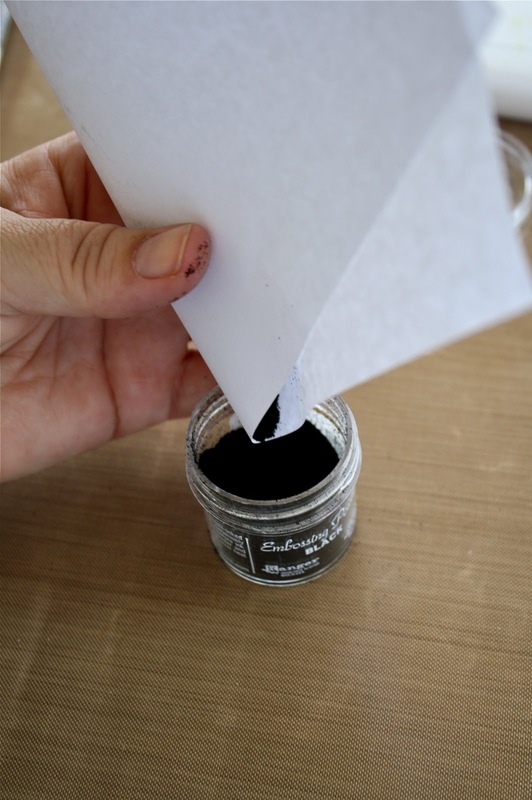 Lay the black card on a piece of computer paper and pour the embossing powder over the card. Don't worry about the amount...all the leftovers will just go back into the bottle. 7. Gently tap off the powder...NO flicking with your finger. Melt the embossing powder with heat gun. I am going to put my two cents in here...the Ranger heat gun is worth every penny. It's quiet and has relatively no blowing air to disperse the embossing powder you just added. 8. Once your black card is cooled, you are ready to add the wet Perfect Pearls. Spray a bit of water from a mini mister onto a craft sheet or wax paper. Dip a small brush into Perfect Pearls (Heirloom Gold) and add to water. Swirl around until you make a small amount (a little goes a long way) of gold watery paint. 9. Use the brush to “paint” the embossed card with the Perfect Pearls. If you run out just make some more. The background of the cardstock that is not embossed will turn shades of gold depending on how much of the Perfect Pearls you add to the water on your craft sheet, and will bead off the embossed portion as it dries. I admit this looks much richer in person. 10. If you have other colors of Perfect Pearls, experiment by added more colors to the card. I added a bit of Turquoise and Perfect Gold. They look great layered. Set card aside to dry. 11. Use template to cut out center of the chipboard. Discard center. 12. 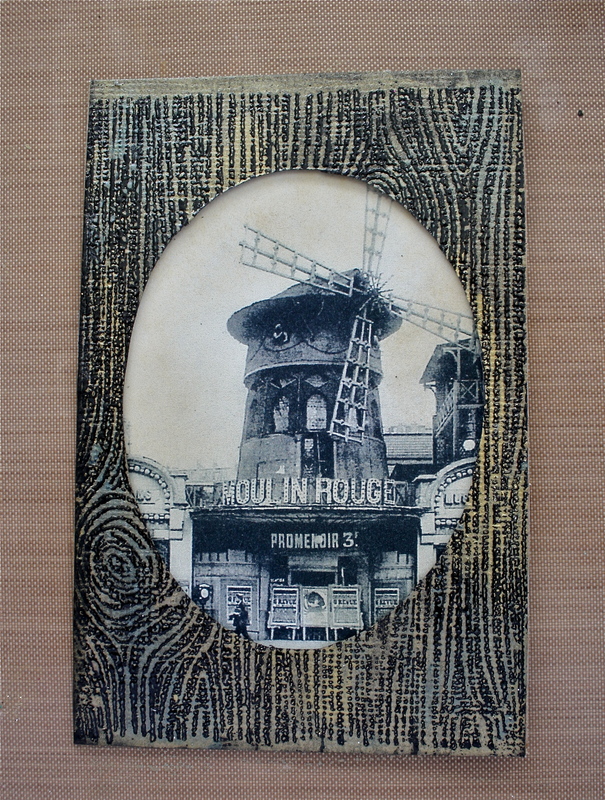 Add glue to the chipboard frame. Lay the black cardstock on top and burnish well to secure. 13. Cut out black center with an X-Acto knife or scissors. It doesn't have to be right up close to the edge or perfect because the braid will cover the edge. You can discard the center or save it for another project. 14. Add picture to the frame. You can use whatever picture you like, maybe a family photo? 15. Use a liquid glue to add gold braid around the oval, beginning and ending at the bottom of the oval. Lay the gold leaf on the twig, then wrap with small piece of fabric (I used Osnaburg). Secure by wrapping ribbon around the fabric 2 times, then knotting off. Leave ends long. 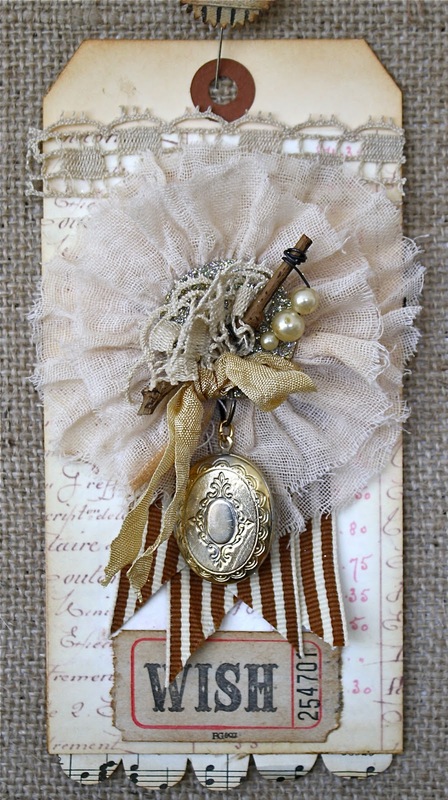 Add beads to the corsage pin and stick into fabric on twig. 17. Adhere twig to the bottom of the oval with a strong glue. 18. 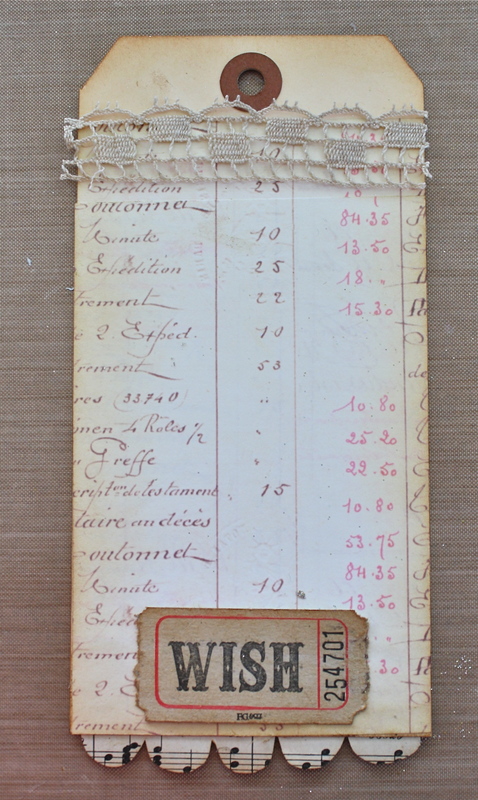 Add frame to previoulsy stamped tag . 19. Stamp, 44.Rue (Avignon) at the top of the picture (black). Refer to the first picture of the tag. When we started this project of the Junk Advent Calendar, I don't think we had any idea what we were really getting ourselves into. But, we got all the kits shipped (WHEW!! ), and now we have moved on to preparing for the actual class. At the beginning I had big plans of doing a couple of decorating projects to my house and sprucing a few things up here and there. We have just had to start on a big project that we didn't think would come this soon, so now I think I'm resolved to running the vacuum and maybe a clean bathroom would be nice. I'm shooting for everyone having such a good time that they don't notice. Paula will arrive early next week, Sande is also staying with me and will arrive a couple of days later. We thought it would be fun to have a day of junking and fun before we start the main event, so we will be out and about on Friday to some of our favorite places. Wish me luck that I get all done as I feel that my hostess skills are not that great! 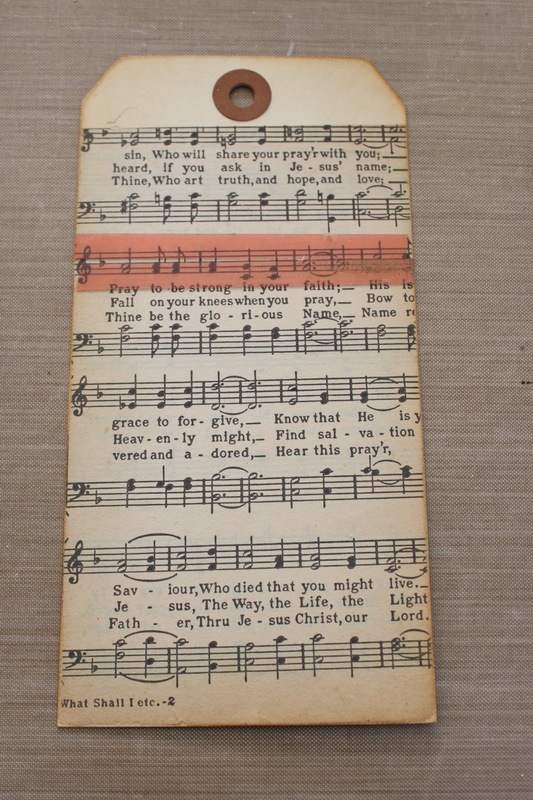 Also, just so you know the ribbon for the advent has hit the Etsy store.....check it out. Watch for a new tag tomorrow....you're gonna love it!! 1. Adhere vintage music to tag. 2. Lay the wings out (no glue yet), making sure you have 5 pieces on the both left and right side. 3. Paint all the pieces of wings (only the front) with acrylic paint (white, off white or cream will work). Let dry completely. Once wings are completely dry, lightly sand edges. I added a bit of Distress Ink but I am not sure this step is really necessary since the gold foil will cover it up. 4. Remove 1 sheet of gold foil from package. One at a time, rub just the tips of the wings with a good glue stick. You can always add more if it is not enough the first time. Lay a piece of gold foil over the top, shiny side up. Peel away, leaving the gold foil on the wing tips where the glue was. Repeat steps on each layer of the wings. If you are not getting enough gold, let foil/glue dry on the wing a little, then peel away. 5. Once wings are foiled, set in order again and glue together. 6. Add glue or tape to center of tag (I used Therm O web Super Tape). 7. Cut a piece of cheesecloth about 2 1/2 x 5” (measurement doesn't have to be exact). Very lightly, lay the cheesecloth over adhesive, then gather to fit on the tag. Press into place to secure. 8. Add wings over cheesecloth overlapping at center. NOTE: Since I bent the wings to make them more dimensional, I used foam tape to adhere the wings to the tag. 9. Run a small piece of wire through a vintage clock face and make a loop at bottom for bell. 10. Hang large jingle bell from loop. 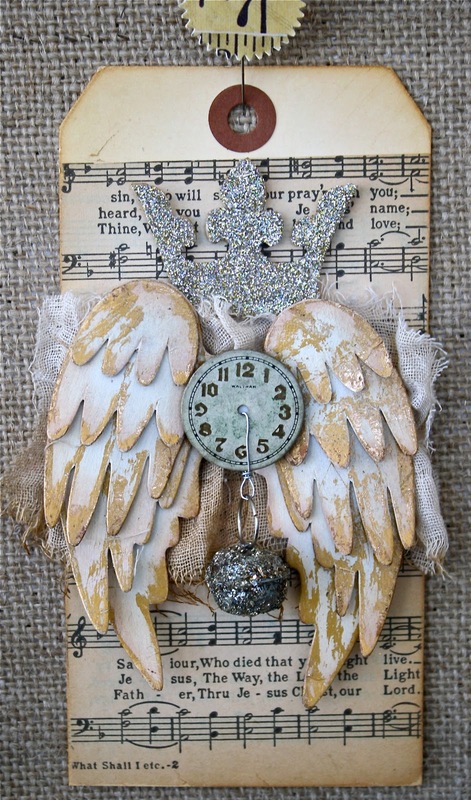 Add the clock face/jingle bell to the center of the wings with foam tape. I used 2 pieces on top of each other to raise it up to the right level. Glitter chipboard crown and add above wings with foam tape. I love this tag, hope you did too! 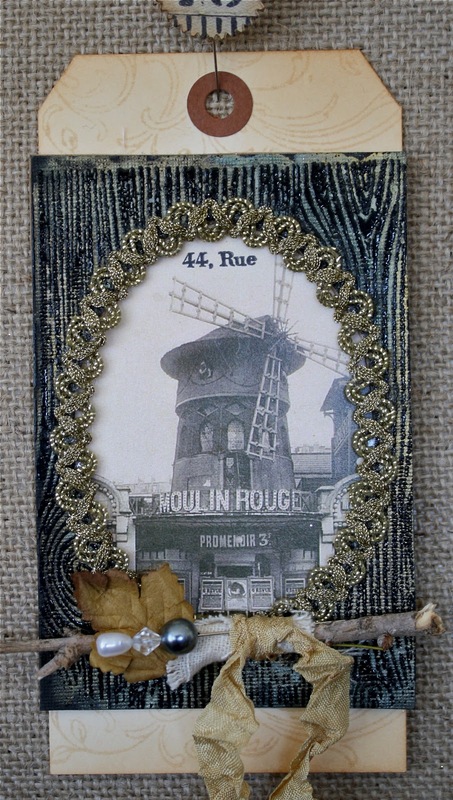 See you on Friday for tag #18 - Moulin Rouge...we'll work with wet Perfect Pearls for this one. 1. Adhere a piece of ledger paper to tag. 2. Add WISH ticket to the bottom of tag. 3. 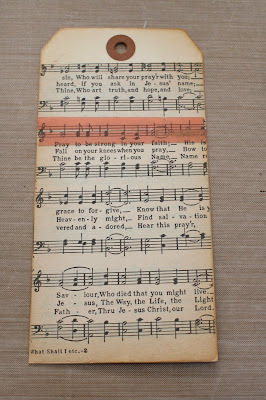 Free-hand cut (yes, you can do it) a scallop border from a scrap of vintage music paper. Adhere to bottom edge of tag. 4. Add crochet lace at top edge of paper. 5. Cut a piece of cheesecloth approximately 2 x 15” long. Run a basting stitch to gather fabric. NOTE: We stitched ours a bit off center so that when you fold it in half one side is longer than the other. 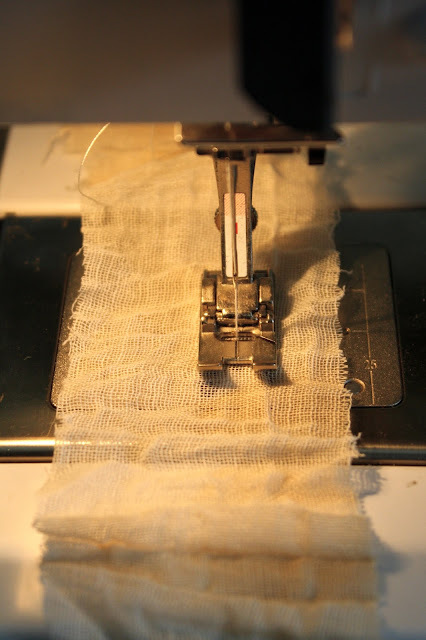 Pull the basting stitch to gather fabric. Fold in half lengthwise at the stitching line. Use a thick craft glue to adhere to chipboard ring. I used a ring instead of a solid circle so the brown striped ribbon could poke up through the ring (see step #8 ). Let dry. 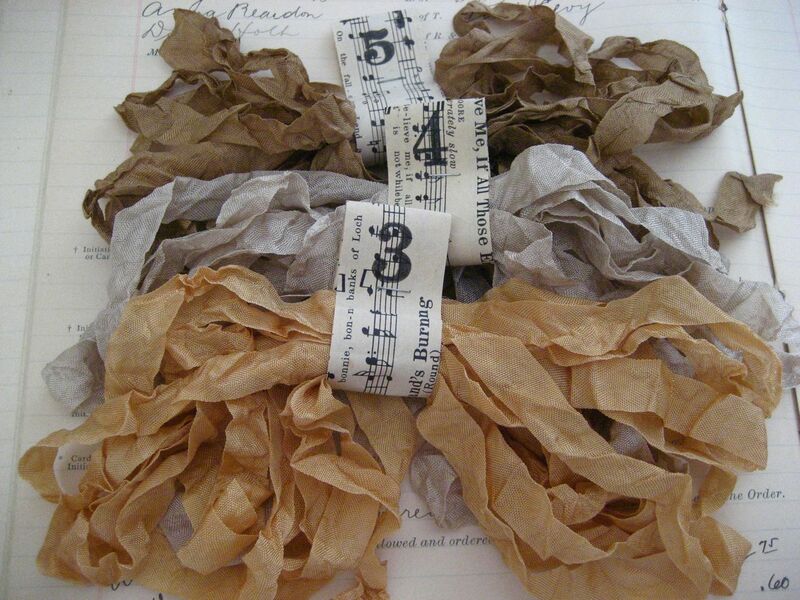 You can use a piece of heavy cardstock or interfacing in place of the chipboard ring. 6. Pinch wide stripe May Arts ribbon in half and secure with wire. Trim ends. 7. Adhere ribbon to the tag with liquid glue. 8. Add glue to the back of the ring and place over ribbon. Hold in place for a few minutes until it starts to dry. 9. Punch a hole at the bottom of a glittered chipboard circle (small hole on Crop-a-dile). Hang locket from jump ring and insert jump ring into punched hole in chipboard. 10. 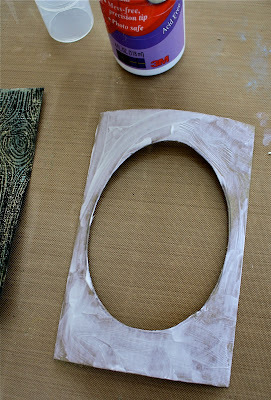 Add glue to the back of the circle then adhere circle over the center hole. 11. Use a piece of wire and a 2” twig to create the center. Wrap wire around the end of the twig. Using needle nose pliers, bend the wire toward the longer end of the stick. Thread 3 pearls or beads onto wire (they can be different sizes). Bend the wire back towards the twig, wrap around twig to finish off. 12. Weave a small piece of crochet lace (same as we used on the tag), onto the bottom of the twig. Gather so the lace is bunched under the wire. Wrap ribbon No. 2 around twig, below the lace and tie a one loop bow. The ribbon secures the lace by sandwiching it between the wire and ribbon. Use liquid glue to add to center of circle. In the photo, the end of the stick is hidden behind the ribbon. Okay, that's it for today. On Wednesday, the much anticipated #7 - Crowned Wings tag.